March = Noodle month! Plain noodles were some of the very first things I cooked with my coffee maker. Back in the days this was a great revolution for me (=an introvert student preferably locked in my dorm room). Now I didn’t have to be social with the other students that I shared the kitchen with. Such a relief! 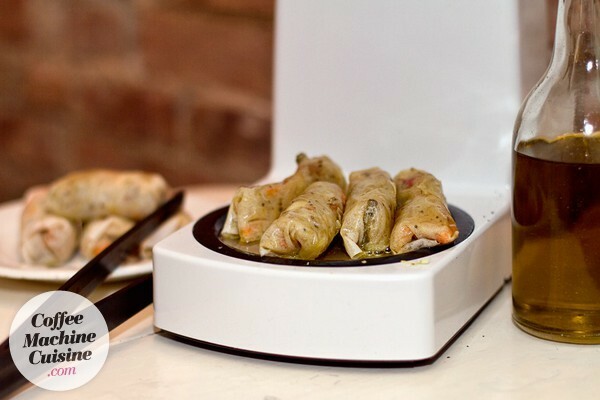 But that was many years ago, I’ve advanced my cooking skillz so today I’ll spice things up and show you how to cook Spring rolls with your coffee maker. 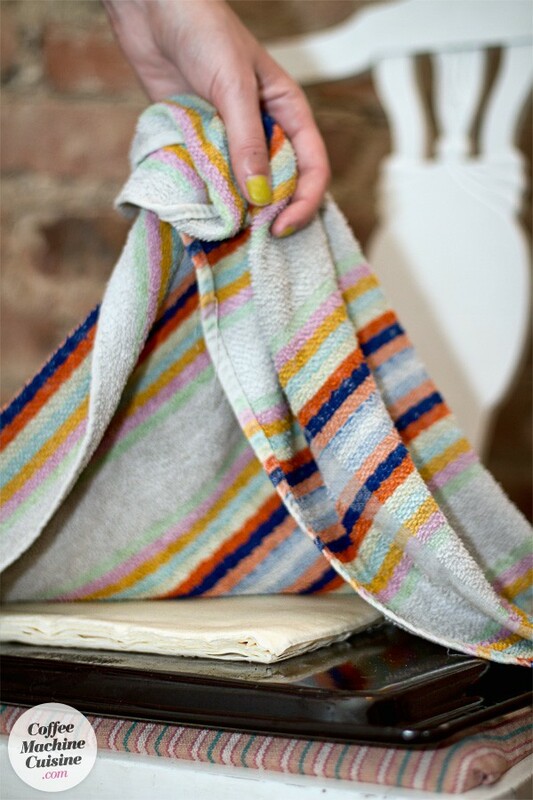 Remove the thawed spring roll wrappers from the package and place them under a damp towel. 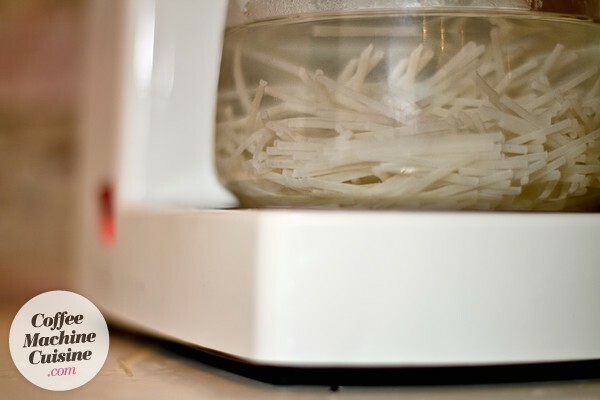 Put the rice noodles in the can and pour the water into the brewer. Start your coffeemaker and let the noodles cook for about fifteen minutes. Meantime chop cabbage, carrot, onion, chili, peanuts and haricots verts. Drain and stir the noodles in a bowl along with the chopped ingredients. Press down the garlic and add mango chutney. Stir and season with salt and pepper. Heat a dash of oil in the can and add the spring roll filling. Coffee maker can cook for about an hour. 1. Place the filling in the middle of the dough. 2. Take one corner and fold it over the filling. 3. Keep the nosey cat away from filling. 5. 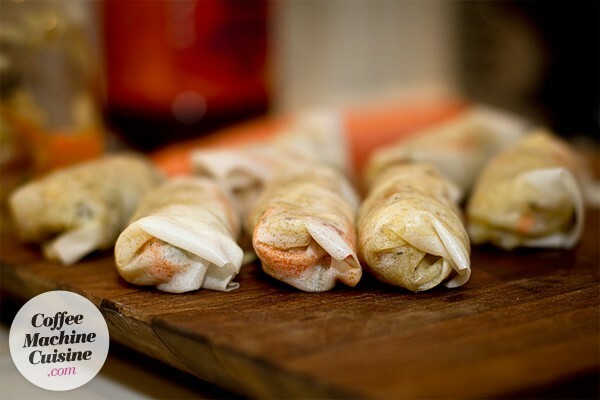 Roll the spring roll. 6. Keep the nosey cat away from spring roll. 7. Secure by dripping some of the maizena/water mixture on the ends. Did you get that at all? Probably not. But you will once you’re at it. Heat the oil directly on the coffee maker heater. Fry the spring rolls (it fits about 4 spring rolls at a time) on all sides for a total of half an hour, or until they get a nice golden color. Turn off your coffee maker. Serve with lots and lots of sweet chili sauce (if you like sweet chili sauce as much as I do). I used rice noodles but other types of noodles will probably work just as fine. They look pretty nice, huh? 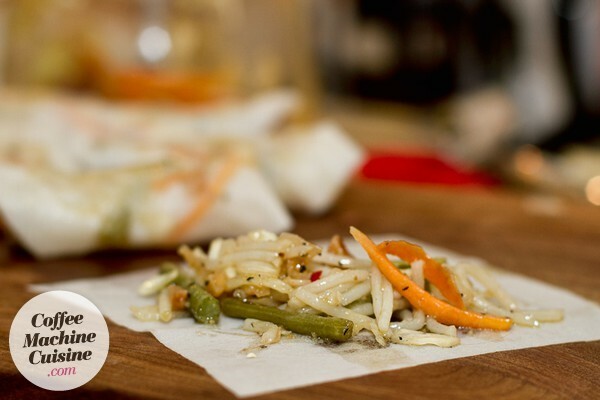 How to cook spring rolls with your coffee maker. I’m not sure where it’s shelved, but The Father Christmas Letters by JRR Tolkein, complete with his wonderful iliastrutlons, remains the Christmas favorite in our family!